This weekend we are offering a discount specially for BlackBerry® Legacy OS users: Ziplorer is on discount for just $0.99 for a limited time only! Ziplorer is the perfect app to save memory on Legacy OS devices. The app allows to package files and entire folders into PKZip or GZip archives. This decreases the overall file size and thereby saves memory space! This particularly comes in handy when files need to be send via a network with limited data usage or slow connection speeds. Through the app, you can access the entire file system of your BlackBerry® Smartphone. This includes zipping or unzipping files from an installed SD card, giving the possibility to backup important data easily and on-the-go! 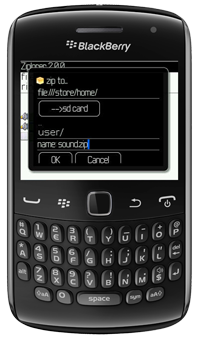 Ziplorer is compatible with BlackBerry® Legacy OS Smartphones.